With Pierateer RAS back to work on Friday (yes, sadly eating and rating pies is not a full time profession just yet!) there was light at the end of the tunnel – a package awaited him upon turning up at his desk on Friday morning. If only every workday started with a pie package!!! 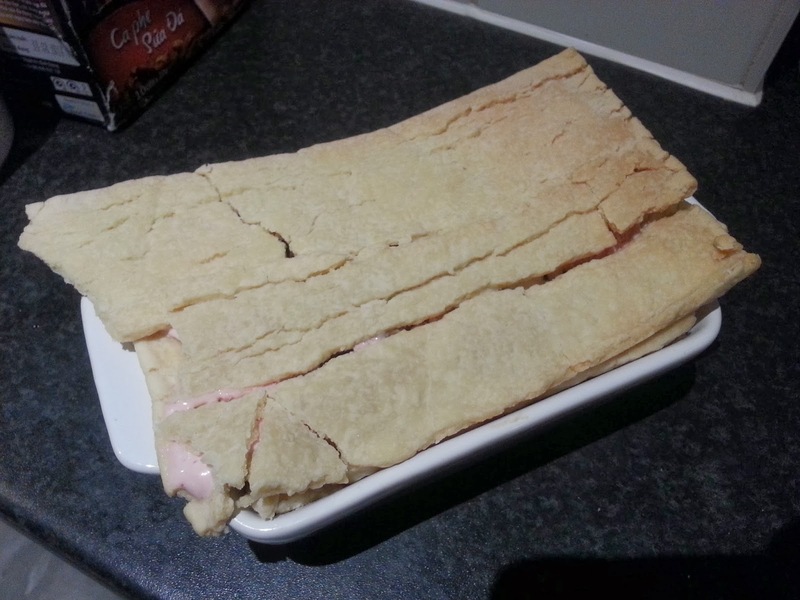 The pie package contents were a pie and a “pie”, both supplied by “The Ark” catering company in Burnley. The owner Jonny has taken over a sandwich shop and is looking to diversiPIE… well, who wouldn’t want to add pie to the menu?! The “pie” in question was chilli with a cornbread crust. Quite a spicy chilli, the meat certainly tasted good and the cornbread and cheese on top was a real treat. Categorically not a pie and you certainly need a plate if you don’t want to eat it out of the foil tray, but a very nice meal. However what you really want to know is how did the pie rate? Well the Steak and Ale was – you’ll be pleased to know – fully encased in pastry. The pastry held together well (you could pick up this pie and eat in your fingers) and the meat was very good. You’ll have to read the full review to see how it rates but it was a very good effort for someone relatively new to pie catering! He’s certainly pushed the boat out… or should I say ark?!... and it’s paying dividends! 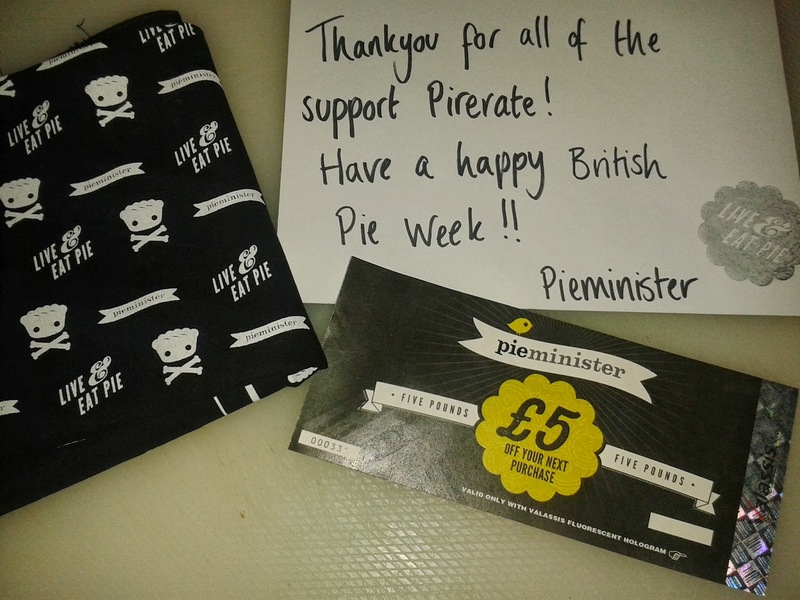 However the other highlight of the day was coming home to find another package awaiting me – though this time not a pie but a Pieminister pie voucher instead and a Pieminister bandana! No excuse not to look like a Pierateer now! You can buy the Bandanas/Neckerchiefs online on the Pieminister shop whilst you order their pies. We’ve reviewed plenty of Pieminister pies and you can read their reviews on the Pieminister Pie Reviews page. "Errr, what's in there?" I hear you ask. 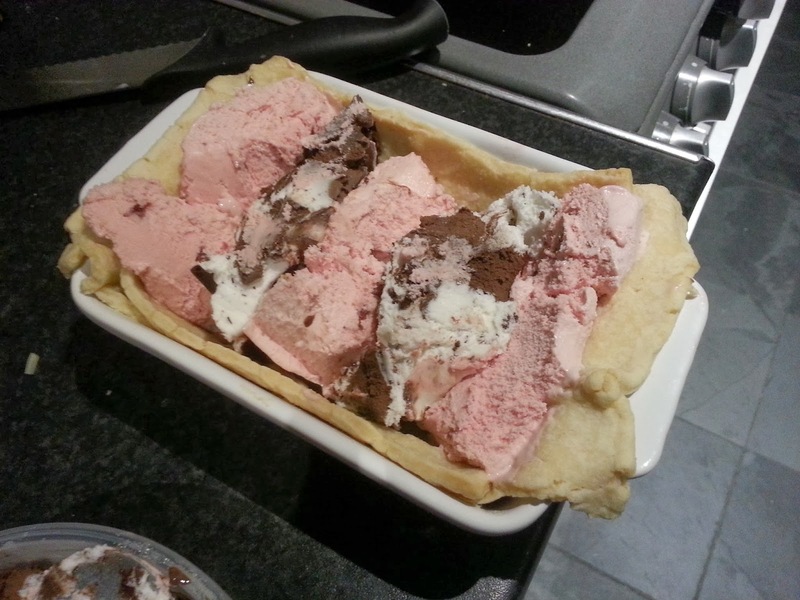 It's, yep you guessed it, ice cream! 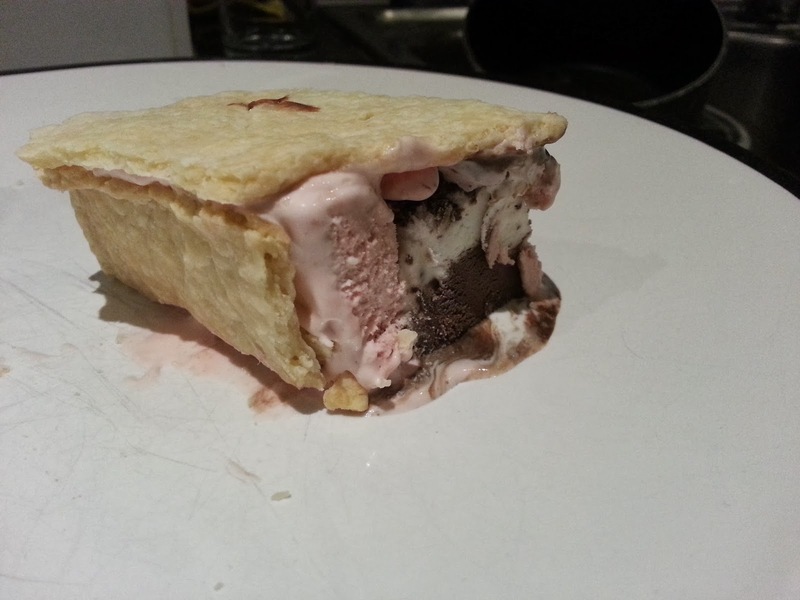 If you're more used to putting ice cream on the outside of your pie, why not switch things round and put it inside your pie. This totally delicious ice cream pie will be the talking point of any dinner party, I can assure you. Pierateer ARL fulfilled her #PiePledge on Day Five by finding a tuna pie in a Eurospar in Spain. See the full review on Pierate upon her return to the UK.